Hybrid vehicles today normally offer all of the amenities that their standard model counterparts offer, but with a hybrid engine system and better efficiency, and the 2017 Honda Accord Hybrid is no different. From the outside, the only noticeable difference between the standard Accord and the Accord Hybrid is the special hybrid badging that appears on the body of the Accord Hybrid. So if you are looking for a hybrid vehicle that contains all of the sharp design and technology of a standard model, look no further than the 2017 Honda Accord Hybrid in Vineland NJ. The Accord Hybrid features energy efficient LED daytime running lights that light up the Accord Hybrid and make it stand out. WIth an aerodynamic design, the Accord Hybrid has sleek lines that draw your eye down the body of the vehicle. A one-touch power moonroof lets more light in, making the cabin feel open and airy, and with eight color options, you are sure to find the right fit for you. 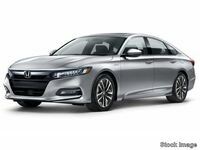 Honda Accord Hybrid has an available remote start and many tech features like a multi-angle backup camera, Honda Satellite-Linked Navigation System™, and a 7-speaker Premium Audio System with Subwoofer. The Accord Hybrid gets an impressive EPA-estimated 48 combined MPG*. A two-motor hybrid system uses one motor to power the Accord Hybrid from a dead stop, and the other to start the engine and charge the first motor. The Honda Accord Hybrid is roomy and comfortable for its passengers. A 10-way adjustable power driver seat makes it easy to find the right spot. Available heated seats in the front and outboard rear seats allow passengers to stay warm and cozy on the chilliest of nights. If you are interested in the 2017 Honda Accord Hybrid, then come to Rossi Honda! *49 city/47 highway/48 combined MPG rating. Based on 2017 EPA mileage ratings. Use for comparison purposes only. Your mileage will vary depending on driving conditions, how you drive and maintain your vehicle, battery package/condition, and other factors.